JWK...Doyle is playing the ME. Just wanted to point that out since last night you said he was out of it. 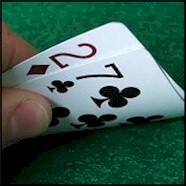 ...with that, what r good links for the wsop updates and anything else that anyone has? wsop.com has it all - chip counts, updates, photos, etc. what is daves last name so i can look him up. And whats with the no show on his day one table? B, it's Roemer, and he's listed in 1206 after day 1B. Here's another link to chip counts..little easier to read, just wish one had a search link. Well Jordan and Moxie, the fine state of Maryland has a Main Event Champion. Merson had a terrific year and I think we all agree that it is funny how he overtook the Brat for player of the year by winning the ME. Now we all just need to petition the WSOP to start these final table shows the last 2 days around noon so that we can actually watch them live. What the hell are they thinking?